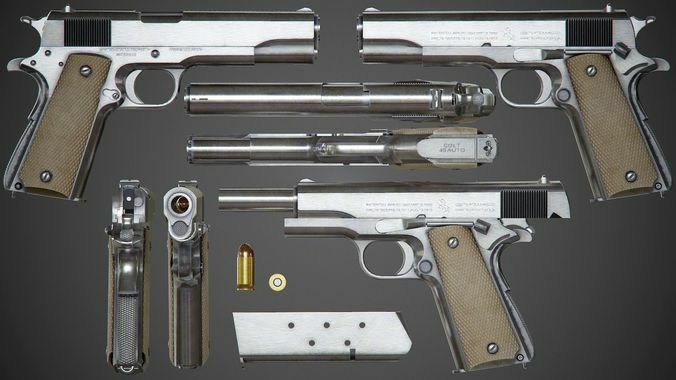 High quality model of the famous pistol Colt M1911 A1 with extra detail textures. Modification with chromium-plated metal. Used by the US Army during the WWII. This 3d model are originally created in 3ds Max. Textures are made in Substanse Painter. All textures biased on PBR shaders. Resolution: 4096px in .png format. Files units are centimeters and are accurately scaled to represent real-life object's dimensions. Previews rendered in Marmoset. The scene with render settings is not included.